‘You got a dog this year? Cos I got a dog this year.’ Roger Avary interjects, looking surprised at the coincidence. 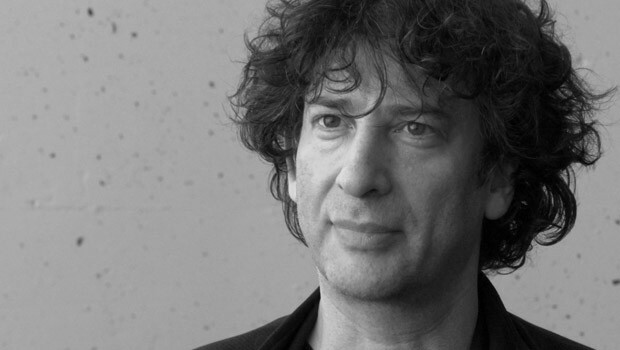 Screenwriters Neil Gaiman, Roger Avary and producer Steve Starkey are in London to talk about their new and much-anticipated film Beowulf, but having read on Neil’s popular blog that he was a bit bored of always answering the same questions at junkets, and had also recently adopted a dog after years as a cat person, I decided to throw in a non-Beowulf-related warm up question. HAving got matters canine out of the way, we moved on to the film. Which is, as said here and in many other reviews, a bit of a headf*&k.
There seems to be a concensus among filmmakers and critics alike, that Beowulf messes with your head. Avary, simply, compares it to taking hallucinogenic drugs. ‘It’s almost like looking at a popup book, or a graphic novel,’ Avary says, ‘and because its completely virtual, its almost like its pure imagination. What you’re seeing is something that’s completely imaginative, like you’re inside your own mind, watching a movie.’ But all are agreed that watching Beowulf, especially in 3D, is an experience like no other. So what were the challenges and opportunities that working in this way presented, compared with conventional film-making. Which brings us to another aspect of this way of making films. What on earth is it like for the actors? Of course similar changes to the actors’ physiques could be achieved through prosthetics but they bring their own challenges. But when Avary and Gaiman first thought of adapting Beowulf, with Avary planning to direct, it was going to be a live-ation film. ‘Stop motion animation, Avary interjects. ‘And it would have been cute – little Beowulf fighting… On the other hand, you wouldn’t have got that ‘Oh my God’ feeling as the sea monsters attack. With the huge advances in ‘home cinema’, is this kind of spectacular film-making what the industry needs to keep audiences coming to the cinema? ‘Yes, there’s no doubt that when you come out of the Beowulf experience, it feels almost bigger than cinema, I mean it’s experiential, not just simply that intimate storytelling that we’re used to. It’s a much bigger experience and one that simply can’t be duplicated in the home. So I think it will be something that the industry is looking for; a new reason to drive people into theatres and see movies.’ Starkey says. So, how does Avary feel about the finished film?